Murat (Chic) Young was a young cartoonist who specialized in curvaceous cuties. Beginning in 1921 he created a string of comic strips - The Affairs of Jane, Beautiful Bab and Dumb Dora - all featuring flirtatious flappers of the Jazz Age. Then, in 1930 he gave up the successful Dora to develop Blondie who would become America’s most popular housewife in a family strip still syndicated today to 2,300 newspapers in 55 countries. Columbia Pictures tapped into the Blondie craze in 1938 and struck gold when it produced the first feature film based on the strip for only $85,000. The movie grossed $9.0 Million and became the first of 28 low-budget Blondie comedies produced by the studio over the next twelve years, becoming Hollywood‘s longest running series. The films owed much of their success to the stars, Penny Singleton and Arthur Lake who not only looked and acted like Chic Young‘s Blondie Bumstead and her bumbling husband Dagwood, but sounded like their his fans imagined they would, as well. Although Gloria Blondell, Una Merkel and Shirley Deane were all first picks for Blondie and Stu Erwin was the top choice for Dagwood, Singleton and Lake got the roles and the casting seemed inspired. Lake was 32 when the Blondie series began. He was already familiar to movie audiences with a lengthy resume that included 36 features and 90 shorts - 26 two-reel comedies in 1925 alone - including leads in Universal’s silent Drugstore Cowboy and Horace In Hollywood series of the late 1920’s. Although his feature film work until Blondie was primarily limited to supporting roles, Lake had the title role in the 1928 comic strip inspired Harold Teen. (2) About this time he became friends with the sons of publisher William Randolph Hearst who introduced him to his future wife, Patricia Van Cleave. Their marriage at Hearst’s San Simeon estate made the society pages in 1937 and it was later divulged that Van Cleve was actually the daughter of Hearst and actress Marion Davies. Columbia Pictures let no time lapse before churning out its first sequel to its surprise hit Blondie - Blondie Meets The Boss - in March, 1939. Its box office success and the contining popularity of the comic strip was noted by R.J. Reynolds Tobacco which signed Singleton and Lake to star in a Blondie radio series as the summer replacement for Eddie Cantor’s Top Ten show on CBS. Despite his popularity, Cantor’s political activism already had him on thin ice with his sponsor. His widely reported remarks at the 1939 Worlds Fair attacking isolationists Henry Ford, Father Charles Coughlin and North Carolina Senator Robert Reynolds by name sealed his fate with Camel cigarettes and Cantor was cancelled at the end of the 1938-39 season. The prime Monday night timeslot at 7:30 suddenly was Singleton and Lake’s to win or lose. They won. Blondie debuted on July 3, 1939 - two weeks before the third Columbia feature in seven months, Blondie Takes A Vacation, opened in theaters. Another three films would follow before the end of the show’s first season on CBS - so no one could accuse Singleton and Lake of not working to help their own cause. Blondie lost 32% of Cantor’s ratings in its first season, but won its time period. The sitcom also finished in Monday’s Top Ten and among the season’s Top 50 programs for the first of its next five consecutive years. Major differences are obvious between the 1939 and 1940 episodes and the Blondie of later years. The announcer, (Bill Goodwin in these examples), opens with the shows with the familiar, “Ah-ah-ah-ah - Don’t touch that dial…” but the similarity ends there. The show was without a studio audience, dialogue was more subdued and Blondie had the general feel of Easy Aces or Vic & Sade. Above all, Dagwood's frantic yell for, "Bloonn...dee!" had yet to be added to the show's opening. Nevertheless, with good writing and a cast of solid supporting actors - most notably Hanley Stafford as Dagwood’s blustery boss, J. C. Dithers - the sitcom continued to build audience. Blondie peaked at a 19.7 season rating in 1942-43 which was two points higher than the Eddie Cantor show it replaced in 1939! It surprised the industry in 1944 when Camels dropped the sitcom after five seasons to make room for Bob Hawk’s CBS comedy quiz involving service personnel that had languished on Saturday nights for two seasons, Thanks To The Yanks. Hawk proceeded to lose 20% of Blondie’s audience in the 1944-45 season and never topped the sitcom's ratings in the timeslot. Meanwhile, Colgate Palmolive Peet picked up Blondie for its Super Suds laundry detergent. Following a short summer run on Blue, the soap company slotted the sitcom in a suicide spot on CBS’s Sunday schedule opposite NBC’s Edgar Bergen & Charlie McCarthy at 8:00. Blondie took a 35% ratings hit into single digits, dropping to 73rd in the annual rankings. Bergen, meanwhile, dropped 20% of his audience from the sitcom’s challenge, but remained comfortably in the season’s Top Ten. Colgate pulled Blondie out of Bergen’s line of fire after the disastrous 1944-45 season and the show began a remarkable comeback. All it took was moving the series back half an hour to Sunday at 7:30 on the CBS schedule. The Bumsteads launched their comeback against NBC’s Fitch Bandwagon and its new hostess, comedienne Cass Daley. Blondie’s 1945-46 ratings increased 20% and the show scored the first of three consecutive Top 50 seasons, all of them as one of Sunday’s Top Ten programs. Two programs from this peak period - 1947 and 1948 - are also posted. By 1948, Blondie was one of the season's Top 25 shows again, doubling the ratings it generated opposite Bergen - an 18.1 against Phil Harris & Alice Faye on NBC. But trouble of a different kind was brewing for the Bumstead family.at NBC - Freeman Gosden & Charles Correll were considering a move of their Amos & Andy to CBS. 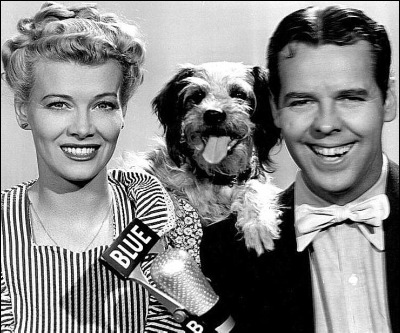 Penny Singleton and Arthur Lake had enjoyed nine seasons on CBS, eight of them in the annual Top 50. The 1948-49 shows on NBC sounded no different than the last seasons on CBS and Blondie was attracting audience against its new Wednesday competition - Ted Mack’s Original Amateur Hour on ABC and Frank & Anne Hummert’s formula potboiler, Mr. Chameleon, on CBS. The October to December ratings show that Blondie averaged a 15.5 and growing to Chameleon’s steady 14.3 and Mack’s 16.6 which would collapse into single digits in 1949. But instead of staying the course and letting the audience rediscover Blondie in its new home, Colgate and its agency, D’Arcy Masius Benton & Bowles, panicked. In one of the stupidest moves in Network Radio history, they publicly fired Penny Singleton claiming that the role of Blondie needed a “fresh interpretation” and announced a competition to determine the replacement for the actress who established the character in two dozen movies and 485 radio shows. Colgate’s promotional stunt backfired as soon as Singleton’s departure was announced in January. Blondie’s monthly rating plummeted nearly 40% from 16.9 to 10.4. Then, in the three months remaining of the 1948-49 season after Rutherford took over the title role, the sitcom’s ratings sank to a meager 6.8 average. Trade papers reported Colgate’s attempts to re-hire Singleton to replace her replacement, but after the public humiliation she suffered a few months earlier, the actress who was still Blondie to millions flatly refused the the soap company’s offer. Colgate cancelled the show and NBC dropped it at the end of the season. Blondie left Network Radio on July 6, 1950 - concluding its roller coaster run of eleven years and three days. The final movie in the Blondie series was released three months earlier. Yet, the comic strip that inspired both survives - authored by Chic Young's son, Dean, and followed by an estimated 280 Million readers in 2,300 newspapers every day. (1) Singleton was a red haired actress had been nicknamed “Penny” since childhood. She bleached her hair for the Blondie role and took the last name of her first husband, Laurence Singleton. Following the Blondie films she became the voice of Jane Jetson in the Hanna-Barbara animated Jetsons television and movie features. Singleton was also active in labor union activities, becoming President of the American Guild of Variety Artists in 1969 - the first woman to head an AFL-CIO union. (2) An excellent slapstick comedian, Lake was the son of a circus acrobat father and vaudeville actress mother. His older sister, Florence, began her extensive 45 year film and television career in 1930 and is best known for her appearances in over 60 RKO Edgar Kennedy two-reel comedies, 1931-1948. She replaced Penny Singleton as radio's Blondie for several months in the 1942-43 season when Singleton accompanied her husband to a stateside Marine Corps assignment. (3) Amos & Andy’s jump from NBC to CBS had a domino effect on both networks. Losing its Sunday timeslot, Colgate took Blondie off CBS and gave it the NBC Wednesday half-hour at 8:00 ET, replacing A Day In The Life of Dennis Day which Colgate moved to Saturday to replace the cancelled Kay Kyser Kollege of Musical Knowledge. To fill the void on NBC’s Tuesday schedule left by Amos & Andy at 9:00, Lever Brothers moved Bob Hope back one hour from his 10:00 timeslot which NBC sold to Procter & Gamble’s Lava Soap for Big Town, lifted from the CBS Tuesday schedule at 8:00. The Tuesday slot on CBS was given to Mystery Theater, (fka Molle Mystery Theater), on NBC’s Friday schedule. All of the programs involved except Mystery Theater lost audience in the 1948-49 season. (4) Singleton and Lake would appear in three more Blondie movies after she left the radio cast. Then, Columbia Pictures and Chick Young’s syndicate, King Features, disagreed on royalty terms and the series came to an end in 1950. Ironically, King Features was owned by Hearst newspapers, so in effect, William Randolph Heart put Arthur Lake, his son-in-law, out of work. (5) Arthur Lake appeared in one of several attempts to bring Blondie to television. The 26 episode series, co-starring Pamela Britton in the title role, was produced by Hal Roach Studios and ran during the 1957-58 season on NBC.